Gentrification has become a key concept in recent years for describing current urban development trends (not only in Berlin). The background is a changed geography of gentrification that is no longer limited to individual neighborhoods, but encompasses broad central areas of many cities. 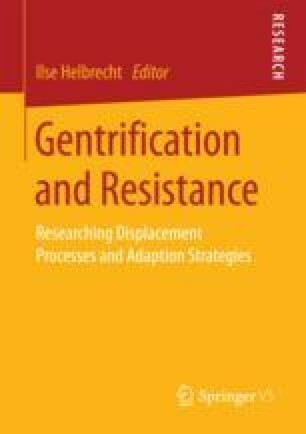 Urban social movements, in particular, but also some municipal governments, have put the topic of urban gentrification processes on the political agenda in recent years and are seeking suitable strategies to counter the displacement they entail. ISER - Institute for Social and Economic Research, University of Essex (2016) British Household Panel Survey (BHPS). URL https://www.iser.essex.ac.uk/bhps (Accessed 20 January 2016). Schnuck, O. (2014) A Generic, City-Wide Framework for Measuring Gentrification and Its Application to Munich. Masterarbeit, Universität Duisburg-Essen. URL www.schnuko.rlvtn.de/gentrimap/thesis.pdf (Accessed 15 May 2015). Schulz, G. (2015) Aufwertung und Verdrängung in Berlin: Räumliche Analysen zur Messung von Gentrifizierung. Masterarbeit, Humboldt-Universität zu Berlin. URL http://gentrified.space/gentri/docs/MASTER_GuidoSchulz_2015.pdf (Accessed 15 May 2015). SenStadt (2013) Lebensweltlich orientierte Räume (LOR) in Berlin. Website der Senatsverwaltung für Stadtentwicklung und Umwelt Berlin. URL www.stadtentwicklung.berlin.de/planen/basisdaten_stadtentwicklung/lor (Accessed 15 May 2015).